The flag of the Malaysian Federal Territory of Putrajaya consists of three vertical bands of blue, yellow, and blue with the Malaysian coat of arms in the center. 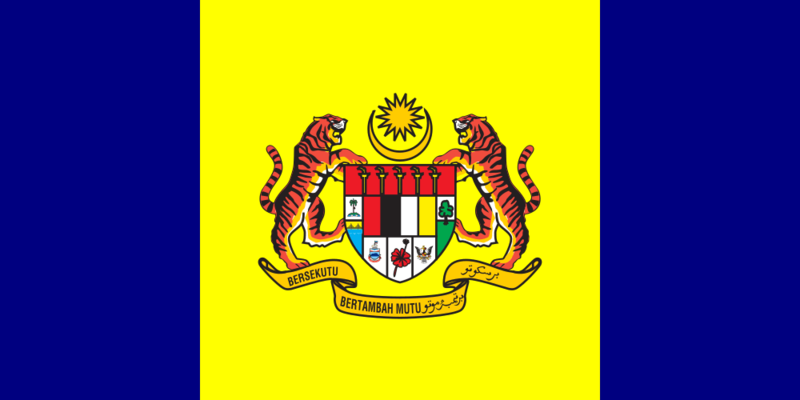 The Malaysian coat of arms consists of a shield supported by two tigers, with a fourteen-point star and crescent above it and a banner below it. The banner consists of the phrase “Unity is Strength” written in two languages, Malay and Jawi. The star and crescent represent Malaysia’s monarchy and the religion of Islam, the country’s official religion. This flag was adopted on February 1st, 2001.